Is it time to find the guru within? Are you ready for unlimited success? It has been said very eloquently in the past that “what we fear the most is not that we are inadequate. Our deepest fear is that we are powerful beyond measure…” (Marianne Williamson) And so, just like with our shadow (that which causes shame) we suppress our dreams of acheiving our highest potential and project them onto others. Pop idol and guru worship are classic cultural expressions of the golden shadow. 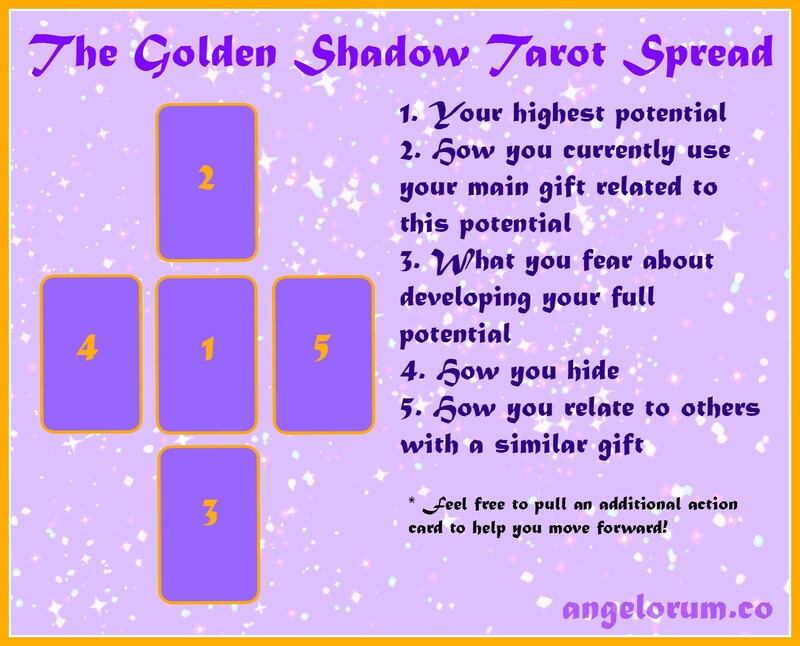 So how about we use the Tarot as a mirror to find where our own golden shadow projector is lurking within the psyche? Great idea, right?! 2. How you currently use your main gift related to this potential. 3. What you fear about developing your full potential – success can be scary… look deep into this mirror to understand your fear… only then will you be able to resolve it. 5. How you relate to others with a similar gift. Are you jealous? Or are you constantly praising and encouraging others while lurking in the shadows? Have you places someone on a pedestal? This spread is just the mirror. It reveals the projector within… Where do you go from here. Perhaps you would like to pause and reflect. Writing your thoughts down in your journal is probably a good idea. Or maybe you are ready to pull another card (or two) on how to progress from here. Focus the question on what action you need to take in order to develop your highest potential. Take some more notes. The ego isn’t going anywhere so it will be handy for you to have these notes to refer back to when it starts whinging again!